The 1.2L engine will be removed, and replaced by something with more (much more) power, and still be able to drive normally with it. A Z20LEH Opel engine is prepared to go in. This is an 240 bhp 2.0L 16V Turbo OPC engine which you normally find in Astra-H OPC and VXR models. This engine is tuned by Opel Tuning company (www.opel-tuning.nl) to 300 Bhp. The gearbox is an M32 6-speed which normally can be found in Opels with OPC engines, and also in Fiat Punto abarth cars. We have used the gearbox from an Z20LEL Opel, which has longer gears. It is fitted with a Quaife Limited slip differential, and upgraded with strenghtened parts . Both gearbox, and clutch can handle 500Nm. We fit the engine with a switchable boost controller, so we can use less power in lower gears, and more power in higher gears. Togehter with the limited slip differential, this will improve traction, and reduce torque steer. Take a look at the following pictures, we will update this page with pictures as the project goes along. Old 1.2L 69Bhp engine removed. Engine bay with fitment of the new 2.0L engine. This engine and gearbox assembly is much bigger in dimensions. We have to make lots of modifications to retain the original Fiat airconditioning system and altenator system. This engine is not going to run on any stand alone engine managment ECU (like DTA), but we will use the original Opel Bosch Motronic ECU. This ECU will be connected to the onboard Fiat electronics. All systems will keep running as normal like dash dails, power steering, airconditioning, body control system, airbags, etc. 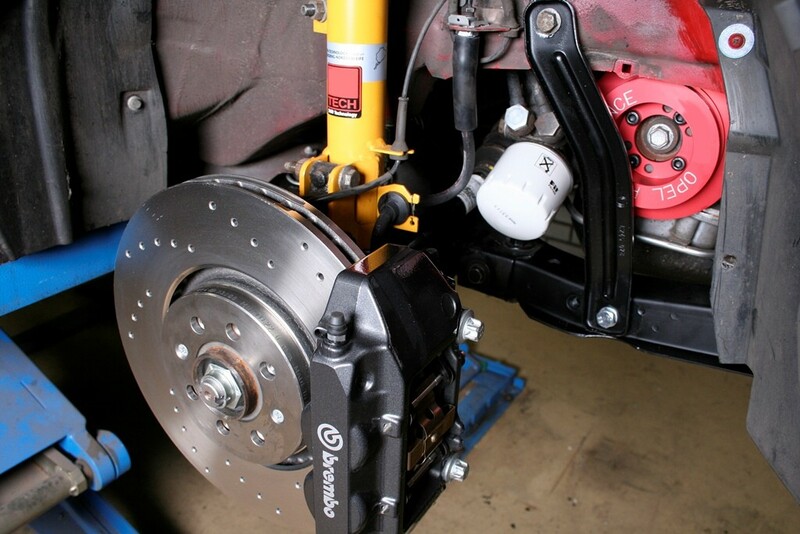 Brake system fitted on the front axle: Brembo 4 piston brake calliper with Brembo brake pads and 308x25mm drilled sport brake discs. Suspension: Bilstein Sport with eibach springs. Suspension arm and suspension bushings: Fiat 500 Abarth. Suspension: Bilstein sport with eibach springs. Exhaust system: 63mm Group-A stainless steel with exhaust pipe left and right. Modified Fiat 500 shift linkage to control a smooth gear change (with short shifter of course) of the M32 Opel gearbox. 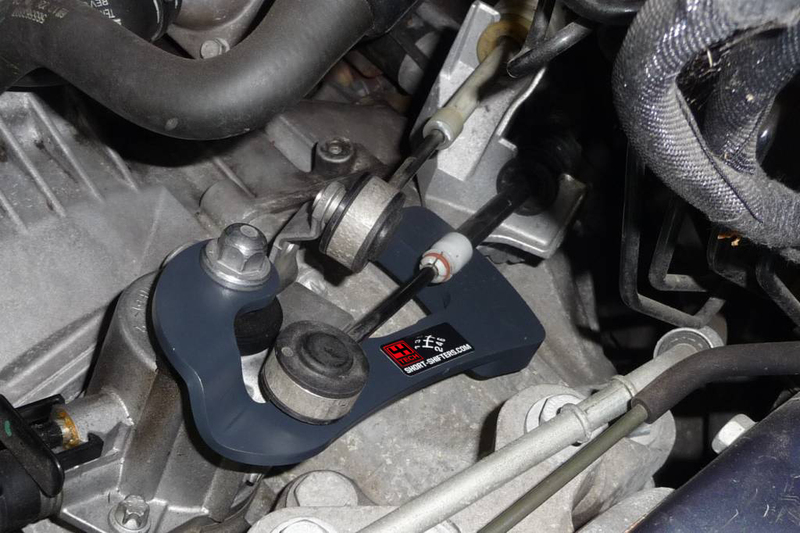 We've fitted the gear selector shaft from a F40 Opel Astra OPC gearbox together with the 4H-TECH K-Shift Short shifter. Gear knob also modified to 6-speed layout. Find out more about this special car, and follow us on facebook! 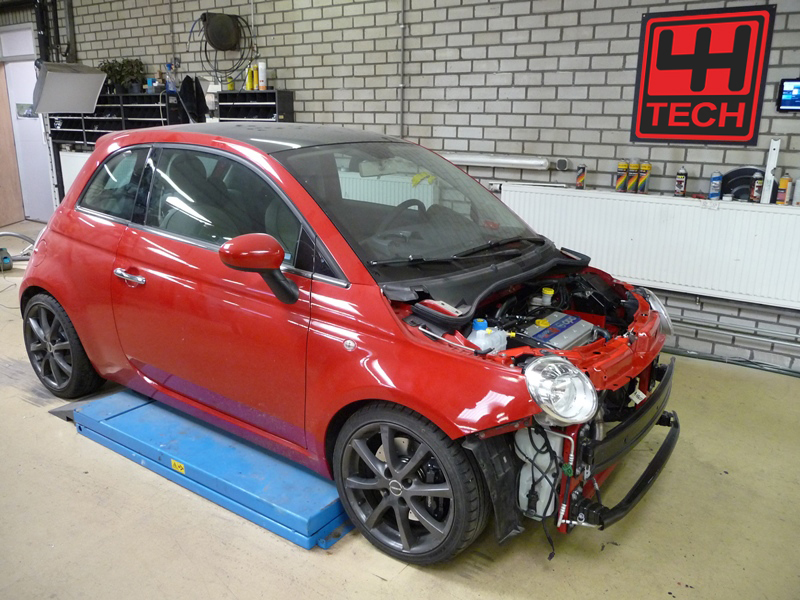 We keep you updated with news about this special build 4H-TECH Fiat 500 OPC, and also about all the newest short-shifters!